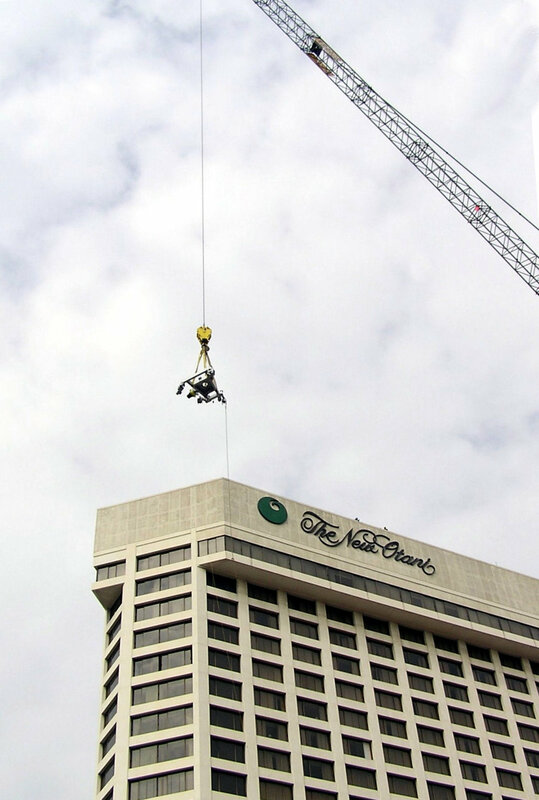 The New Otani Hotel — Sky Rider Equipment Co. The New Otani Hotel, located near the Los Angeles City Hall, is a 255 foot tall, 21-story structure. Originally built in 1975, no means were provided for window washing. Sky Rider was hired in 2005 to provide a window washing system. Several major challenges were present: a) no means for raising equipment to the rooftop would be available, b) a 15 foot high parapet, c) a helipad somewhat higher than the parapet, creating a clearance problem in two locations, and d) the 21st floor was cantilevered out in four locations. Most of the East elevation was cantilevered as were three additional corners. All but one of the cantilevered corners were determined to be accessible by providing a Building Maintenance Unit (BMU) with platform. The BMU was designed with an articulating “approach system” to bring the platform in under the building cantilever. 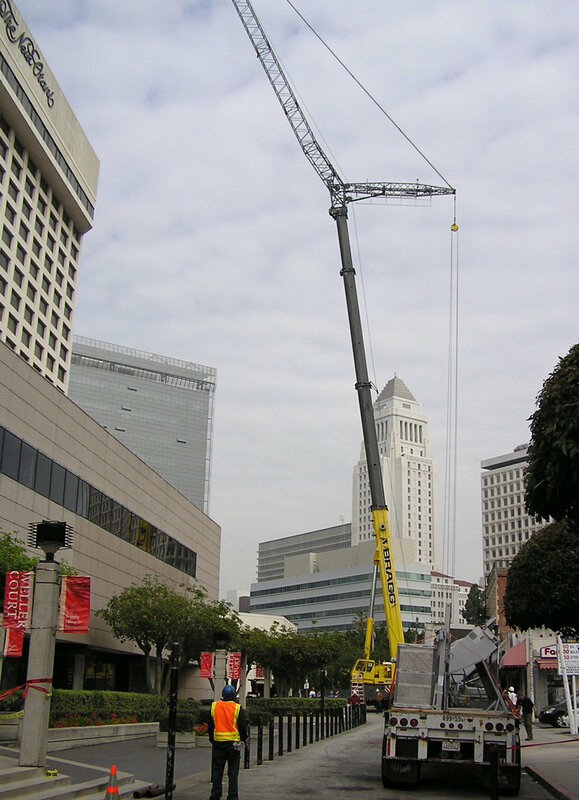 The first problem was solved by hiring Bragg Crane to provide a ground based crane of sufficient size to access, not only the 255 foot height of the building but, the additional 100 feet of reach to distribute numerous bundles of track throughout the rooftop for later installation. The second problem was solved by designing an elevated roof car track. Kajima Construction designed, provided and installed the elevated support structure (based on loading and dimensional criteria provided by Sky Rider), while Sky Rider designed, provided and installed the track on top of the structure. To begin the track and roof car installation, and to minimize crane down time, two sections of track were installed on the support structure, in advance, by bringing them through the building interior and installing them manually. Using the Bragg crane, the roof car was installed piece by piece onto the short section of previously installed track. 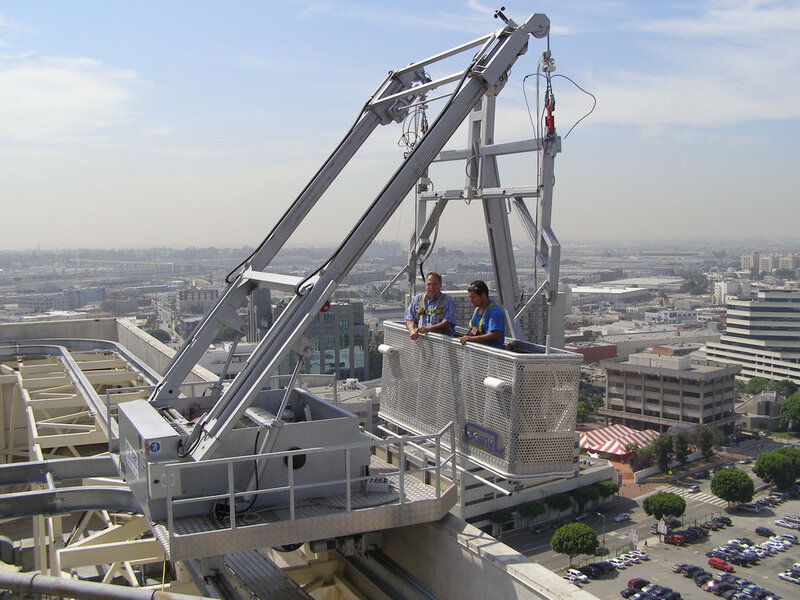 Because the track was elevated, a special rolling mini-crane (designed and built by Sky Rider was utilized for lifting the track sections from the roof into position onto the support pedestals. The next problem, that of helipad clearance, was solved by using a low profile BMU. Utilizing jib arms that can be raised or lowered as necessary, a position indicator was provided on the track to sense the approaching roof car. The jib arms must then be fully lowered and outboard to permit continued roof car traversing under the helipad screening. The cantilevered locations are handled by the “approach system”, which is an integral part of the platform design. As shown below under a corner soffit, it consists of the platform, the hinging support structure and the hinging hydraulic arm that extends outward, away from the platform. As the hydraulic arm moves outward, the platform articulates inward toward the building face. When fully extended, the platform can be brought up to the underside of the soffit to access the uppermost window. The final issue is the soffit condition at the South West building corner. Because of its width and depth, a self-powered, ground rigged platform was required for access. Special suspension devices were permanently installed in the underside of the soffit for access. The completed machine is used to access the soffit suspension devices and to assist in the rigging procedure.